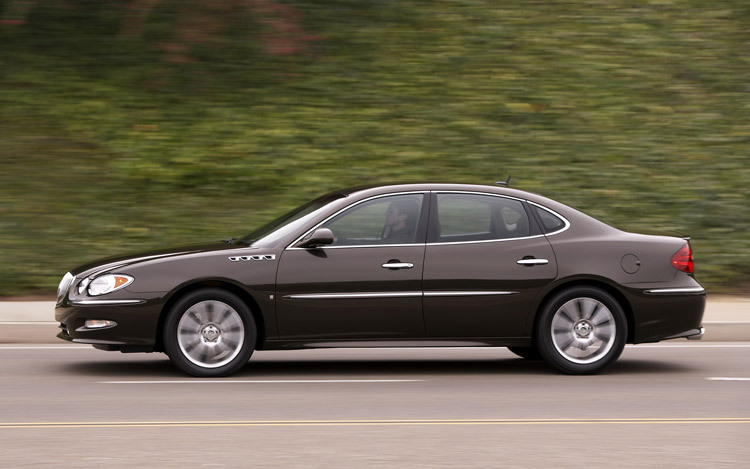 Future Curbside Classic: 2008-09 Buick LaCrosse Super – Do 300 Horses and 8 Cylinders Change Your Mind? 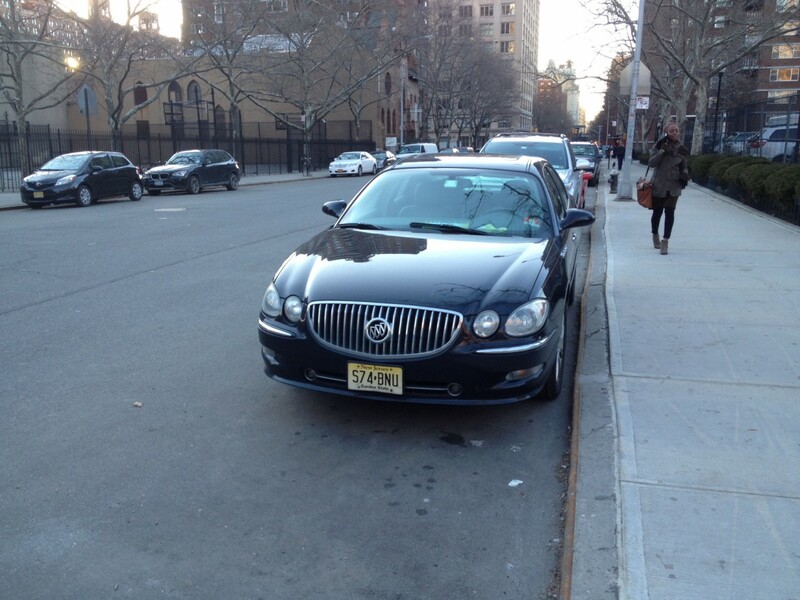 Not too long ago, our J.P. Cavanaugh expressed his dissatisfaction with the first-generation Buick LaCrosse. Many of you agreed the LaCrosse was a somewhat half-baked effort, considering the era in which it was introduced. Its debut year, 2005, had also marked the launch of the similarly-priced Chrysler 300 whose bold styling and rear-wheel-drive dynamics received tremendous critical acclaim and sales numbers. 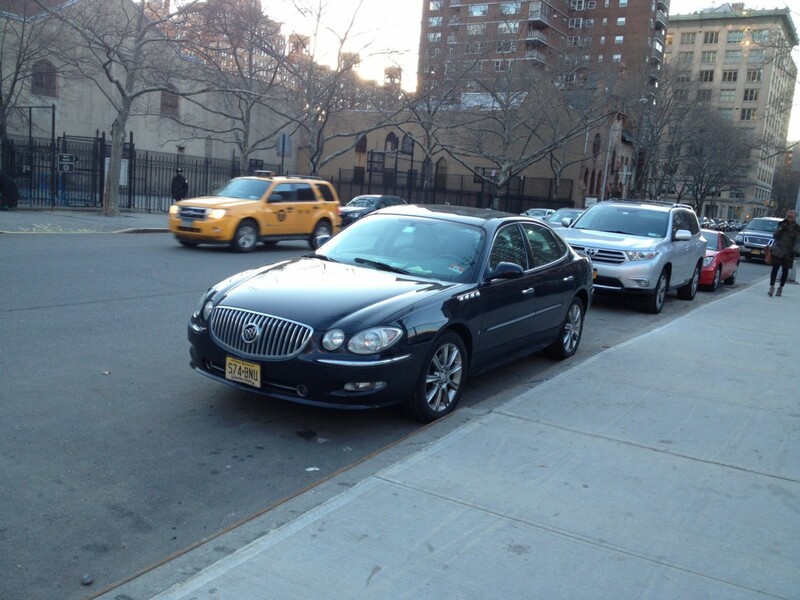 Next to that, the bulbous LaCrosse – still riding on the aging W-Body platform – seemed decidedly unexciting. Buick once enjoyed an upper-middle class positioning, but there was little reason to buy the purportedly more prestigious LaCrosse over, say, an Accord. But would a 300-horsepower, 5.3 V8 make the LaCrosse more palatable? Most of the LaCrosse’s flaws of course remained, but the results of wedging a honkin’ V8 in a milquetoast, mid-size car with front-wheel-drive weren’t too shabby. Of course, that pesky Chrysler 300 was already offering big V8 performance in a more attractive package, so the short-lived, scarcely-marketed LaCrosse Super never tore up the sales charts. In order to inject some excitement into Buick’s sedan lineup, and to help keep the brand’s momentum going after the launch of the extremely successful Enclave crossover, Buick had dusted off the Super nameplate for 2008. First introduced in 1940, the Super had slotted above the entry-level Special but below the Century and Roadmaster. The name would be a victim of Buick’s lineup renaming of 1958. 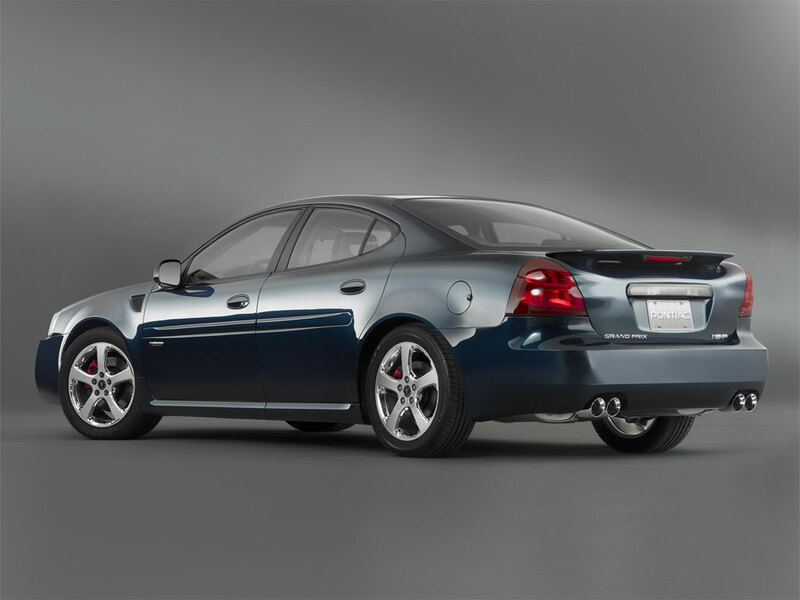 The name would return 50 years later as a performance sub-brand, comprising LaCrosse and Lucerne sedans engineered by GM’s Performance Division. Rather than focus on simply increasing power, the new sub-brand was said to emphasize both greater dynamics and refinement. While the Lucerne Super featured GM’s venerable Northstar V8, the LaCrosse Super would come with the LS4 V8. 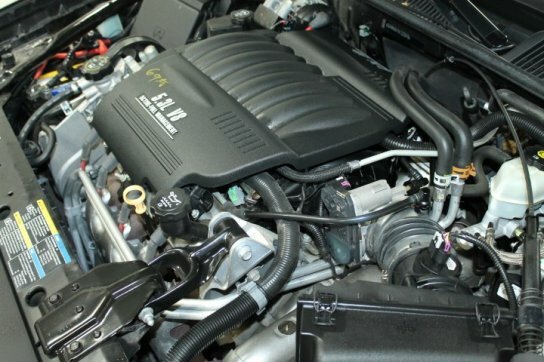 GM had introduced this engine in the W-Body platform in 2005 with the Pontiac Grand Prix GXP, followed by the Chevrolet Impala SS and Monte Carlo SS in 2006. 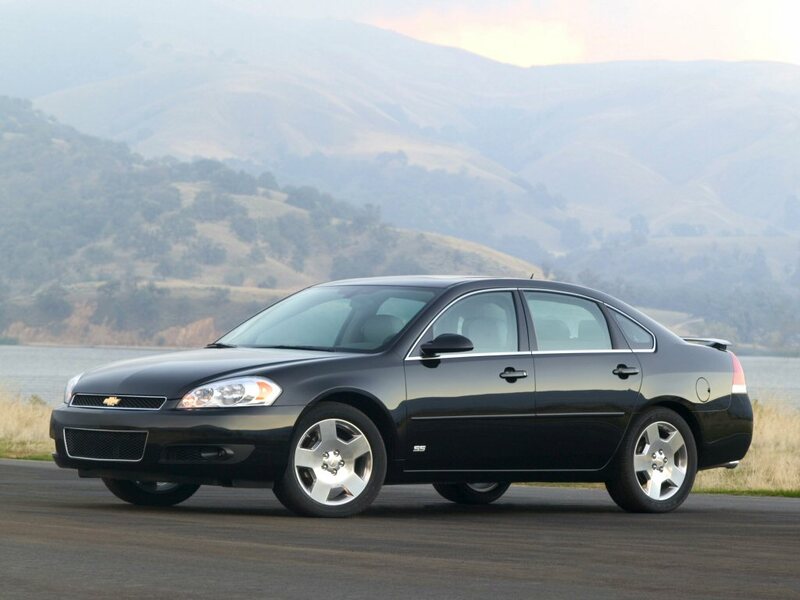 While the Grand Prix GXP famously used bigger front tires and had various other performance modifications including a TapShift automatic transmission and Bilstein shocks, the LS4 Chevys’ performance improvements were scarce. The GXP thus received modest critical praise for its effortless power and surprisingly competent dynamics, while the SS twins received scorn for their flaccid, thoroughly unsporting handling. Although the LS4 had the same displacement as the Vortec 5300 used in GM’s trucks, it featured cylinder heads from the LS6 V8 and an aluminum block. To make it fit in the W-Body engine bay, the crankshaft was shortened and the water pump mounted remotely. Thanks to the use of aluminum, the LS4 was actually less heavy than the 3800 used in the Grand Prix. All LS4s featured Active Fuel Management (also known as Displacement on Demand) which shut off cylinders under light-load conditions to aid fuel economy. Thanks to this technology, the LaCrosse Super achieved 16/24mpg but required premium gas. The LaCrosse Super split the difference between its W-Body counterparts in athleticism, receiving more modifications than the Chevy but fewer than the Pontiac. The LaCrosse Super still received Bilstein monotube shocks as well as larger brake rotors and a steering rack with closer fitting gear teeth and tighter bushings. The ride was more compliant than the firm GXP, but the handling was more buttoned-down than the SS. Torque steer had been significantly quelled and the modifications to the steering rack improved feel slightly. Throttle mapping was less aggressive, and the LS4 lost three horsepower in its tri-shield application due to a retuned (and quieter) exhaust but still had a hefty 300 hp and 323 pound-feet of torque. Those figures actually bested the more expensive Lucerne Super, which made do with only 292 hp and 288 lb-ft. While the Lucerne accomplished 0-60 in around 7 seconds, the LaCrosse Super was capable of the dash in just 5.7 seconds. However, it made do without the Lucerne’s Magnetic Ride Control, although the Lucerne in turn lacked the Active Fuel Management technology and was less fuel-efficient. The LaCrosse Super was easily the most exciting, performance-oriented Buick since the 1980s, although it was a second slower from 0-60 than the legendary GNX. Buick didn’t label the Super as a muscle car, instead billing it as a “luxury touring sedan”. It benefited from the same Quiet Tuning improvements, like laminated glass, as other Buicks. These helped render the car’s cabin serene but for the muted growl of the LS4. Body roll was more pronounced than in the GXP, and yet Car & Driver found the Super stopped shorter, held onto the skidpad longer and felt more stable at high speeds than its ostensibly sportier cousin. 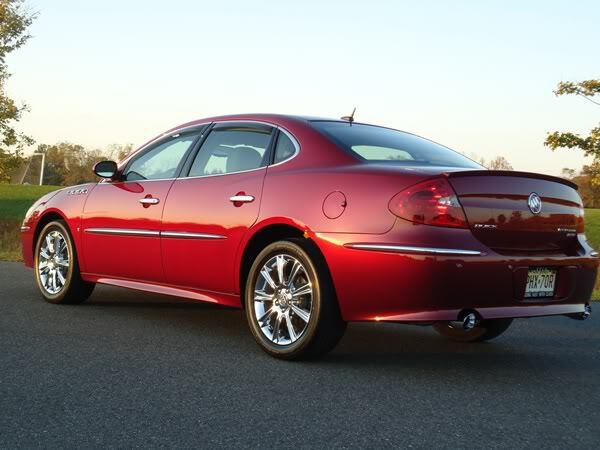 While the GXP received flashy wheels and exposed, red brake rotors and the SS had large badging and unique wheels, the Super’s exterior treatment was much more subtle. All LaCrosses received a larger, bolder grille for 2008, inspired by the beautiful Velite concept car. Supers were differentiated with quad Ventiports, 18-inch alloy wheels, a neat decklid spoiler, dual chrome exhaust tips and extended rocker panels. The look was subtle, almost to the point of being unnoticeable: the perfect sleeper. Colors were limited to black, silver, red and brown. But as J.P. Cavanaugh pointed out, the LaCrosse did share an uncomfortably close resemblance with the 1996-99 Ford Taurus. There were some pleasant, curvaceous details in the LaCrosse’s sheetmetal, but its front-wheel-drive layout hindered their application. The LaCrosse suffered from an excessive front overhang, which throws off the proportions, but the Super’s exterior enhancements did help elevate it above lesser LaCrosses. In Super trim, the LaCrosse received some minor interior tweaks. Silver accents were employed on the dash, doors and sill plates and the gauge cluster was blue, as in the Lucerne Super. Seats featured woven “Dreamweave” inserts, although they were still fairly flat and lacked much in the way of bolstering. 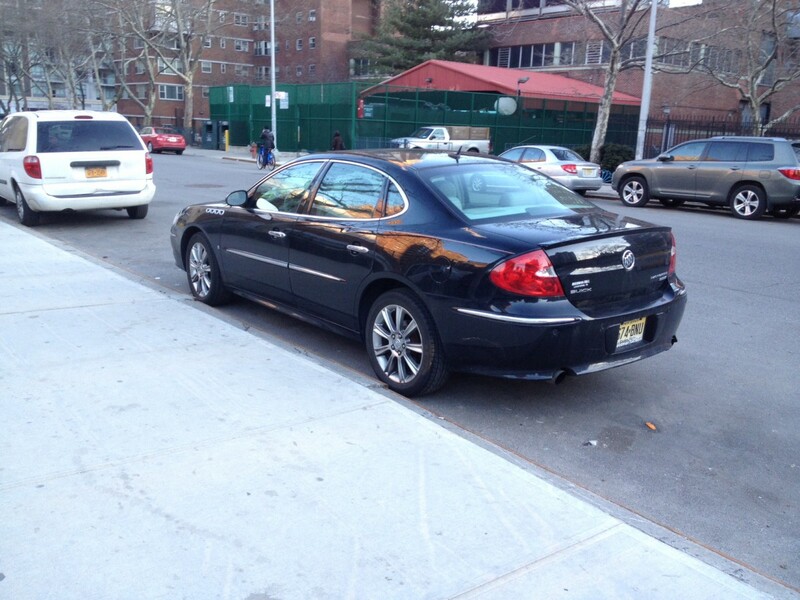 Supers were relatively well-equipped, with heated leather seats and rear park assist. But the LaCrosse’s interior flaws – dated, fiddly switchgear and various low-rent plastic trim pieces – remained in evidence, and the interior was not as elegant as the Lucerne Super with its stitched leather dash top and suede trim. There was still no AUX jack or navigation screen, although the interior was available in a cocoa color which could be paired with the Super signature exterior color, Dark Mocha Metallic, for an intensely brown affair. Overall, the interior was neither sporty nor as modern and elegant as that in the similarly new-for-2008 Cadillac CTS. 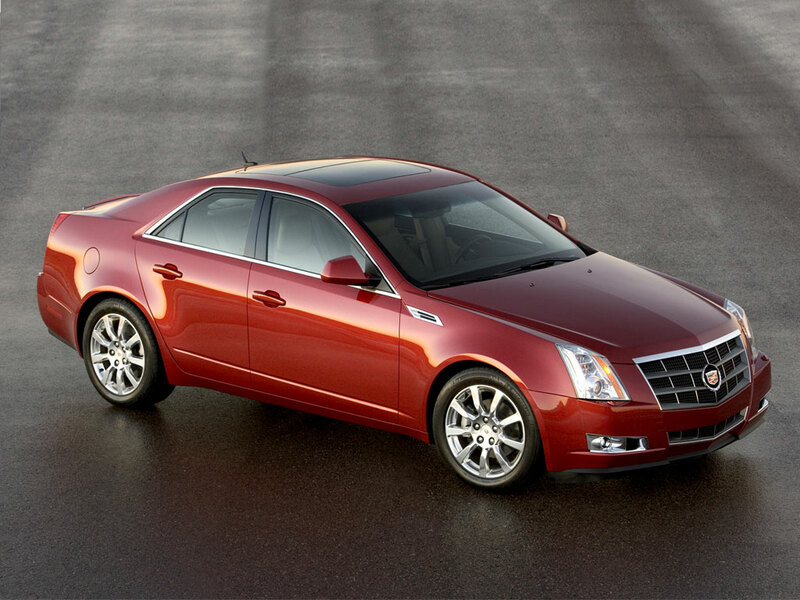 That CTS was another convincing alternative to Buick’s sporty new sedan. After all, an extra $4k netted you the Caddy with its exquisitely styled interior and exterior and much newer platform with better handling. Basically, the CTS was an objectively better car in every way. An issue with the Super that wouldn’t rear its head until later was the reliability of its 4T65E-HD automatic transmission, originally designed for much less powerful applications. W-Body enthusiasts, especially those on sites like GM LS4 and LS1Tech, have denounced these transmissions for their unreliability. GM’s Performance Division had managed to make a reasonably competent “luxury touring sedan” out of the LaCrosse, but where was the market? The W-Body was a lameduck platform at this point, with a new Epsilon-based LaCrosse on the horizon and the Grand Prix dead after 2008. 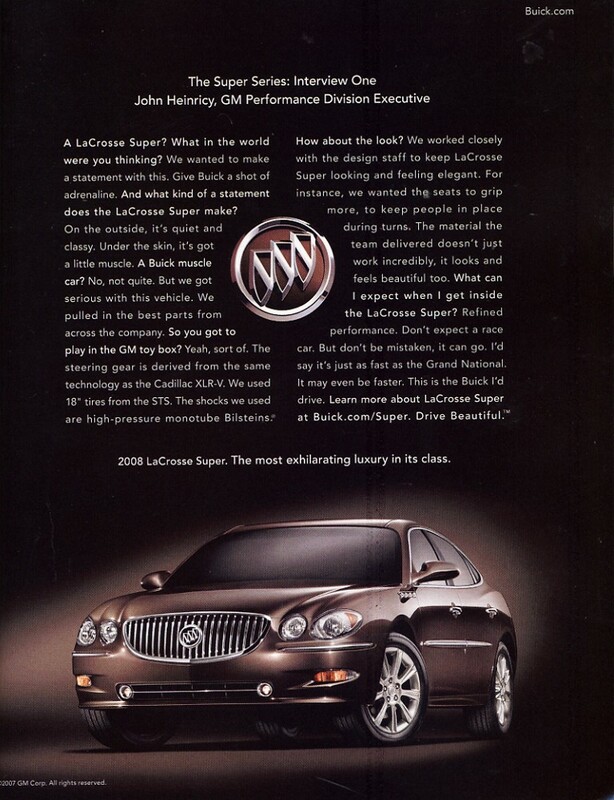 Buick anticipated the Super would account for around 10% of LaCrosse sales. Buick had been optimistic. Maybe it was the lack of promotion or the abundance of compelling competitors, but the LaCrosse Super clocked a meager 2,277 sales in 2008. The following year, only 139 were sold. The GXP and SS were cheaper but still outsold the Super by at least 2-to-1; even the moribund Monte Carlo SS V8 had massively outsold the Super in its truncated run a few years earlier. Well over 90% of LaCrosse sales during 2008-09 were humdrum CX and CXL models with the Iron Age 3800 up front. It’s hard to figure out who the target market was for the LaCrosse Super. It was probably too subtle to appeal to those who eventually bought 300s and Chargers. Although it handled competently, it was no sports sedan either: consumers desiring such a car would be better served by the Pontiac G8. Those seeking a powerful sedan in winter climates could option the 300 and Charger V8s with all-wheel-drive. The Super lacked the high-quality interior of the Lexus ES350, which Buick would more convincingly tackle with the 2010 Epsilon-based LaCrosse. All that seems to leave is dyed-in-the-wool Buick fans and perhaps the odd Avalon cross-shopper who found themselves tantalized by the extra power. As of yet, there has been no reintroduction of the Super nameplate to the LaCrosse line. Buick’s short-lived attempt at a performance sub-brand would die in 2011 with the Lucerne Super, but performance would live on. The Regal GS – another old name dusted off – boasts turbocharged performance and an aggressive exterior, as does the more sedately-styled Verano Turbo. Both are much more well-rounded and convincing cars with higher-quality interiors, more features and modern styling. There is no longer a Buick available with a V8. But did such an engine really help the LaCrosse? Whereas the base Lacrosse was nothing more than a facelifted Century, this was a Regal GS with a shiner grille. Only they actually sold a fair number of those in late-’90s, unlike these. Still, I had no idea the production numbers were that incredibly low. The Impala SS sold crazy well in comparison. I see those around quite often, and actually wouldn’t mind owning one in a “trashy Midwestern muscle” sort of way. These? I just don’t see the point. Very well written and I concur with the assessment. My take on these Buick’s when they came out was that the styling was “quirky” and they seemed overpriced, given the aged W-body platform. That’s the second car in today’s offerings I was not aware of. From the thorough account above, it’s another case where one shakes one’s head with a “what were they thinking” expression. The styling seems to be a mix of Neon (rear) and Taurus (front) elements as well as being afflicted with the cab forward structure which, appearence-wise, NEVER works on cars in my humble opinion, and should be reserved for trucks and buses. Would I have one if I were living in the USA? No, not when good used Mopar RWDs and AWDs or Cadillacs are avaialble at reasonable prices – particularly considering the horror of replacing a blown g/box. The Mopar offering was widely criticised for its poor brakes and in reality cant hold a candle to the GMH or Ford RWD sedans in this market so making a Buick that barely compares with those seems kind of pointless. Great article Will! I remember when these came out, but naturally they didn’t garner much attention from me. You’ve really filled in all the gaps. As was expressed in James’ LaCrosse article and in yours, the first-gen LaCrosse really never had a chance. It was another sedan from one of GM’s dark periods where they were just going through the motions. The interiors were absolutely dreadful. The cheap materials weren’t even what bothered me most, but instead the dated, numbing design that could’ve come out of an W-body from 20 years earlier. My only thoughts then and now is that the Super was a slightly more appealing LaCrosse. If I had to pick, I’d still take a Lucerne. Very interesting read. My takeaway is that the Super starts with the regular Lacrosse which is so dear to my heart, then add a healthy V8 and better brakes/suspension. But then take away transmission reliability. I had always thought that I would like these, but now I’m not so sure. To echo the comment above, it is laughable that GM was so far behind the curve in lacking an iPod jack. It’s understandable that it’s missing in our 2006 model, but by 2009? Really? Thanks for the writeup on this rather silly parts bin job. If there is a place for a fond memory for these 1st gen Lacrosses it is not with overpowered mishmash. Where the Lacrosse was best was in the areas where it was the last. The 3800 was in it’s last best version with ample acceleration, great highway economy and the really fine transmission tuning of the still 4sp automatic. The accoustic glass mentioned in the article and the sensible tire choice left a good highway ride. The styling was still long low and chromey which some might feel a pleasant blasphemy to the church of the shorter taller international school of design. You could still even get a velour bench seat. Bless me Father for I have sinned, I have lusted in my heart for something I have been taught not to want. I think the 300 was/is great and we can guess all the reasons why some would say the V6 Camry Accord Altima Galant Mazda 6 Passat Fusion…. outclass the Lacrosse. I will just say this. When the Lucerne went away and the second Lacrosse got the religion current cars adhere to, we lost something. Something uniquely American and something we had pleasantly all around us, choice. William, your fellow Australians are also gradually loosing choices as the Comadore and the Falcon fade away. Be happy with your CUVs and Mazda 3s, the market has decided. The reading today is from the Book of Job…..
As someone who doesn’t actively track American sedans, yet still appreciates the Chrysler 300 and had a secret longing for the short-lived G8, I didn’t even know that GM put the V8 in any FWD platform other than Cadillac and of course the Aurora. So yes, I’d put the blame on lack of marketing. I just don’t like FWD on powerful vehicles. It never feels “just right”. I wanted to like these, as the idea of a V8 in a Buick just seemed right. And they were more attractive, with the bolder grille, subtle sill extensions, and larger diameter wheels. But it’s true that there is also absolutely nothing compelling about the car. The fact that the CTS started at only $4k more is the final insult–it’s like GM was sabotaging the car. Yeah, V6 with a little less power, but every single other thing about the CTS was about 10x better. Anything with the LS4 has the potential to be desirable. GM should have gotten more use out of that variant – read an interesting comparison of the LS4 to the DI DOHC V6 Cadillac is currently using as their option engine – LS4 makes similar power while being cheaper, lighter and less complex. So the LS4 had cylinder management to improve economy, yet required Premium⛽, which costs more. It might work for CAFE compliance, but not for me. Mandatory Premium is deal-breaker for me. No soup for you, Stuttgart! Industry could’ve added the AUX jack decades ago, but we know why they didn’t. The milquetoast appearance would have been a big turn-off. Like an earlier Buick it looks like a pale imitation of a Ford Taurus, a 1996 in the front and a 2000 in the rear; upon which a “New Jersey customizer” stuck some fake portholes. I remember these (the Super and the Chevy and Pontiac variants) when they came out. I also remember not understanding just what the idea was, but the Pontiac was first I think. The GTO (introduced in 2004) was not doing much in the market place, so perhaps this was an attempt to boost interest in Pontiac? My guess is that perhaps these were a response of sorts to the Chrysler 300. The 325 cubic inch (5.3 liter) engine had 320+ lb-ft of torque, which was more than the 4 speed automatic had really been designed for. My supercharged Riviera had about 275 lb-ft of torque, and the FWD 2002 Seville had 300 lb-ft of torque, both of which were pushing the FWD limits for getting power to the drive wheels from a standing start. Note that the Northstar’s came with a different FWD transmission. 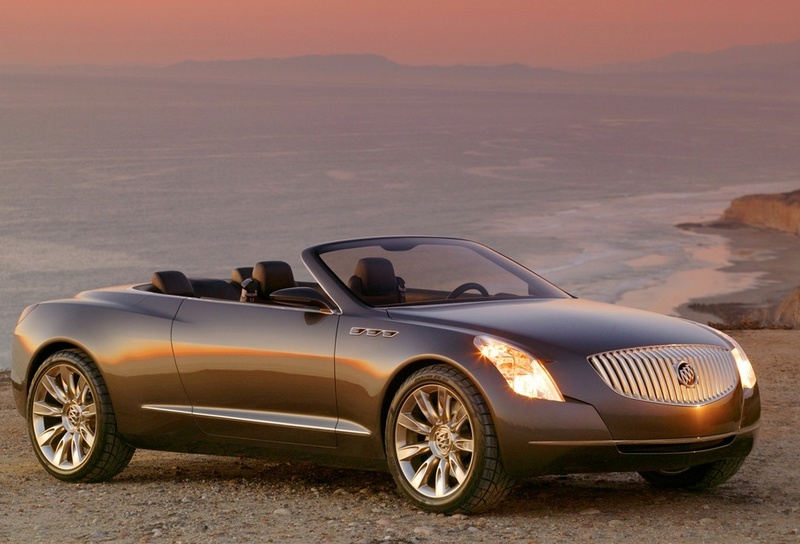 Buick was trying to change its image at the time to bring in younger customers. These cars were on an upgraded W-platform, so it is not entirely fair to say an aging W-platform. Thanks for bringing attention to this overlooked and remarkable car. Have anyone on here actually driven one of these cars? This is one of the quietest automobiles ever produced. The sensation of silent and seemingly unlimited power is very stimulating. The GXP sounded like a motor boat under acceleration. I just drove a friend’s 2008 silver Super and agree it is a very smooth quiet muscle sedan. At a timed 5.5 second 0-60 run I would certainly rank this as muscular performance. I also suspect that most on here are just crapping on this car because it a GM sedan with the letter “W” in it’s chassis. The interior has it’s faults but it is not cheaply made and doesn’t “fall” apart like some claim. The lack of an aux port was lazy and Buick probably figured that most of there customers would have no interest in such a thing. The 4T65 HD was for sure not the trans axle that should have been used in this car without either a huge beef up or another unit altogether like the 6 speed fitted to the 2012 Impala W-body car. I owned one of these for a couple of years. You can see most of these comments are from people who never had the pleasure of driving one. Mine was the Mocha. It was not really an attractive car. It resembled a catfish. 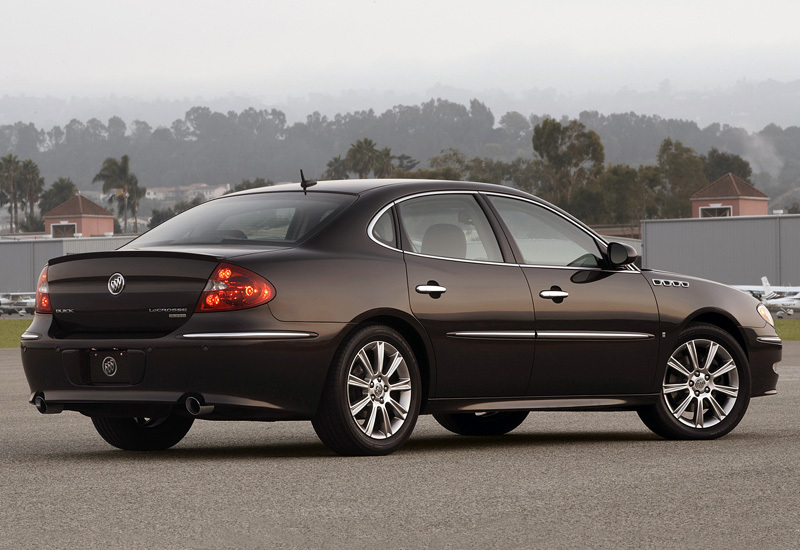 But, it was the latest developed version of the W-Body with the V8 and in tests accelerated better than the GXP. Additionally it didn’t rely on staggered tire sizing to do it. All 235 width. It was surely the best handling and riding of all the W-Body V8s and as you stated was extremely quiet. In terms of mileage, while it did require premium I could get highway mileage as high as 29 mpg. I earnestly miss it and it was the favorite car I’ve ever owned to this day. Have had one since 7/9/19. 90000 on it when I got ut. Runs like new. Beats most anything at a light. Love it to death. Had a roadmaster years ago with a LT1, so wanted another buick with a V8. No regrets. Don’t know what all the bashing is about, love the styling. There were several reasons why these didn’t sell but the biggest has to be the name. 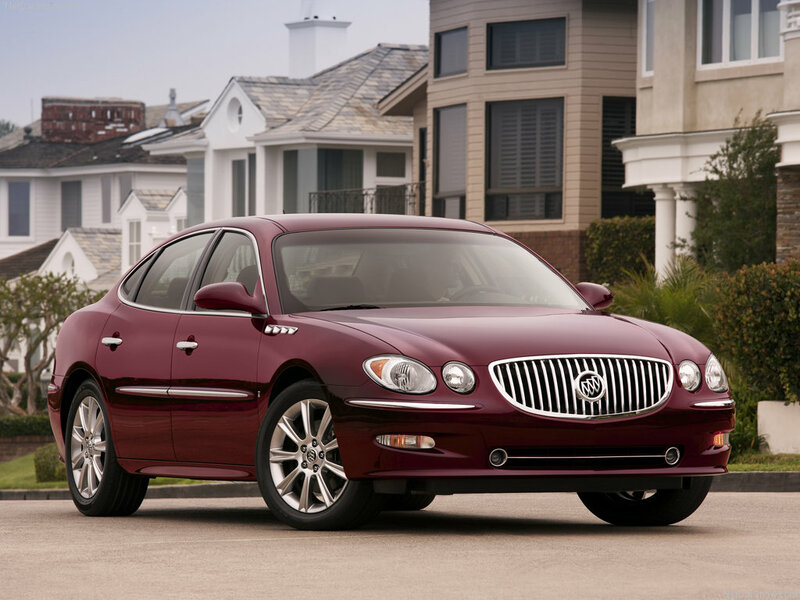 Not Buick but LaCrosse…..Buick changed their model names and then expected buyers to still clamor for them. I wonder how many potential customers knew which model was the “big” car when they heard Lucerne and LaCrosse. I wonder how many knew what an Impala SS and Monte Carlo SS were? Then, there’s all the competition both in and outside of GM. A lowly 6 cylinder Chrysler 300 looked miles better than either Buick. I’m sure the biggest reason why these didn’t sell was that many potential customers had finally given up their anti-Japanese prejudice. I saw several people at my church switch from Buicks to Camrys and Avalons by the mid 2000s. GM’s (perceived?) lack of reliability had finally turned them off. What a dull looking car for a Buick.Yet there was the Velite,an immensely stylish convertible which am sure would have had a large worldwide market.General Motors was once upon a time renowned for its mechanical innovation,particularly Buick early on,and its great style and then reduced to a car Toyota may have designed.Is it any wonder GM almost went under.Hopeless and styleless. All these references to this looking like a taurus knockoff…Im having flashbacks to mid aughties south korean attempts at luxury. If GM had set out to build a car destined to be an obscure sleeper in 5 years, well then bravo. 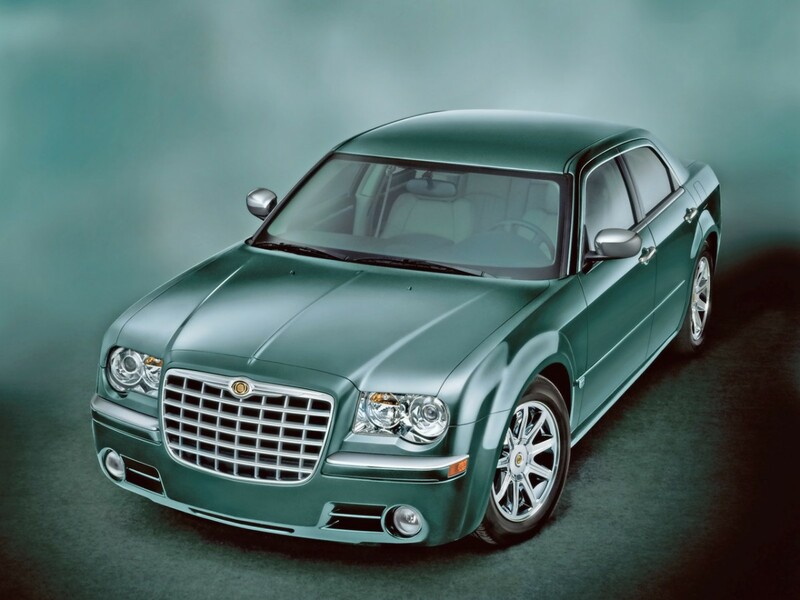 But as a contender fot the Chrysler 300….good luck! How about that droptop concept car? Whats the dealio in that? If buick has a snowballs chance in hell of scrubbing off the stench of old lady perfume and mothballs it’s goint to take something like that. Not some soggy sedan that just pounded 2 Red Bulls to stave off death. Today’s Buick is signified by the Encore SUV, which is bringing in new blood. But with Chevy now offering a lower priced Traxx, who knows how long Encore can keep up sales? There is also the GMC model. But the Encore is higher end. If Cadillac were to get one of these, then Buick would be in trouble. The Denali version probably does take sales away from Buick. But GMC is also probably a part of the Buick dealership too…. I was always a bit perplexed by the sudden injection of rather beefy V8s into mid-size FWD cars at GM. The usual logic that there was fear about meeting CAFE numbers seemed to disappear – perhaps finally technology had made the then current CAFE numbers easier to reach. GM’s timing was pretty awful – dumping relative gas guzzling engines into generally thrifty cars just in time for a gas price spike, a nasty recession, a new round of CAFE legislation and creating new poster children for why American manufacturers make the wrong kind of cars. Despite the FWD, these cars were mildly entertaining if you actually rode in or drove one. 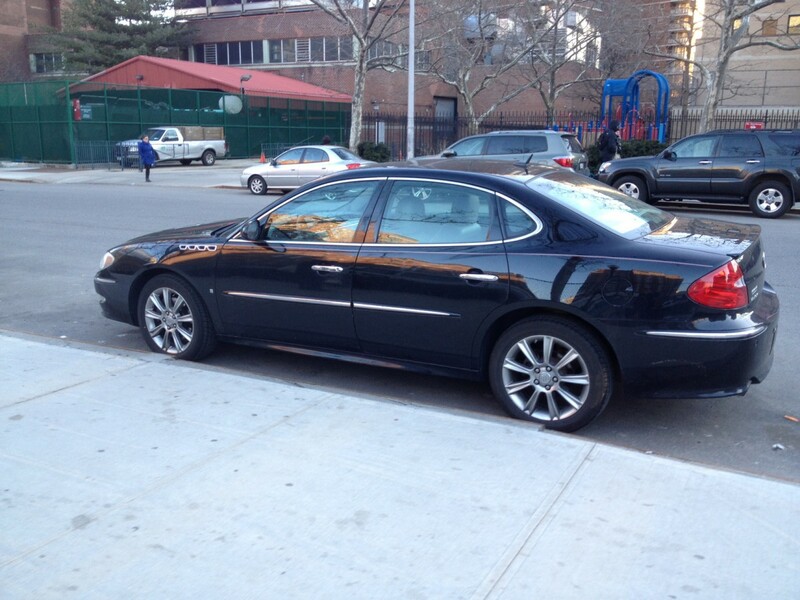 A friend bought new an Impala SS and it certainly had some kick and a nice engine sound for a FWD family appliance. There were three engines – 3.8, 3.6 and the V8. The 3800 combined was 21, the 3.6 (higher performance axle ratio) 20, and the V8 19 MPG. City rating for the V8 is 1 MPG less then the V6’s.